Evan Abla & Julia Roat-Abla: Up Next - the new Peel-a-Meal Communion - SuperSized! Up Next - the new Peel-a-Meal Communion - SuperSized! A new article from slate.com, "The Chick-fil-A Church." I particularly appreciate the view of Eddie Johnson, "Just like that Chick-fil-A owner/operator, I'm here in Nashville to open up our franchise and run it right," wrote Eddie Johnson. "I believe in my company and what they are trying to 'sell.' "
The column is titled: "Religion, Spirituality, and Sacrelige." It certainly is one of the three! I guess I'm confused about your confusion, anonymous. 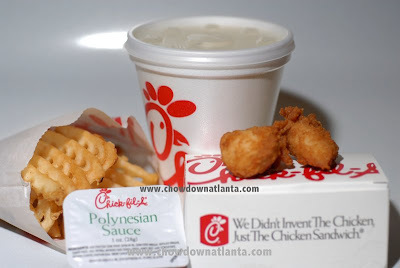 Let's be clear - I love Chick-fil-a and their heavenly waffle fries. What I have a problem with is the crass marketing mentality that flippantly compares Christ's Church to a fast food franchise.